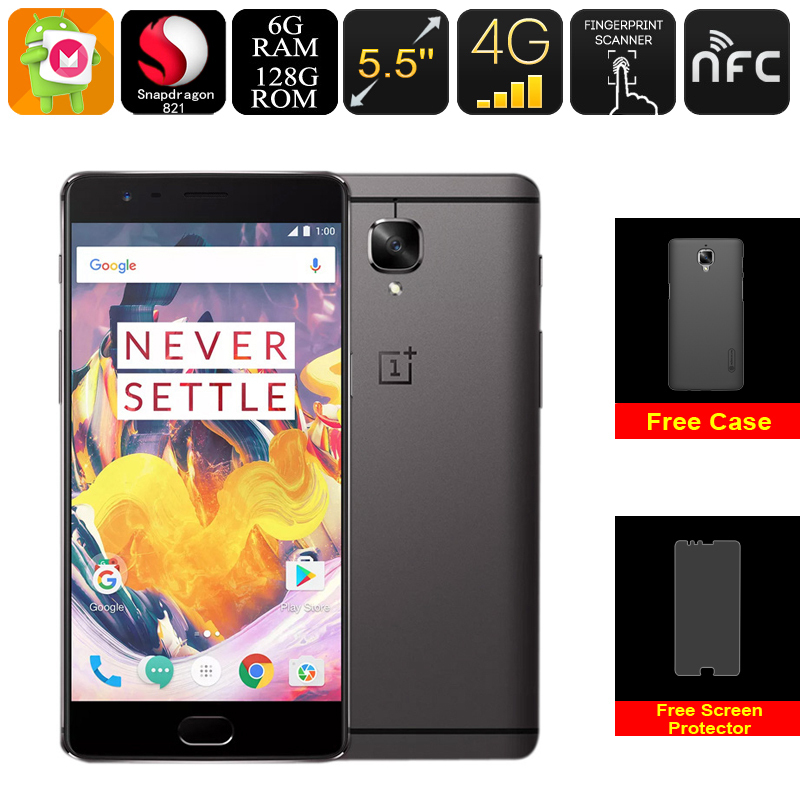 Successfully Added OnePlus 3T Gunmetal Smartphone 128GB - Android 6.0, Quad-Core CPU, 6GB RAM, 5.5-Inch FHD Display, Dual-IMEI, 4G, 16MP Cameras to your Shopping Cart. The OnePlus 3T Gunmetal Smartphone is one of the latest Android phones launched by the Chinese smartphone company OnePlus. Featuring an ultra-thin and high-end design, this beautiful flagship smartphone truly is stunning to look at. With its 5.5-Inch Full-HD display, the OnePlus 3T allows you to enjoy all your favorite media in absolutely stunning beauty and detail – truly lifting your mobile media experience to heights never experienced before. Portraying all your favorite movies, games, and applications in mesmerizing 1080p resolution and vivid color, this Android smartphone provides you with a truly cinematic experience from the palm of your hand. Packing the Qualcomm Snapdragon 812 CPU, the OnePlus 3T Gunmetal is an Android phone that is capable of handling the most demanding of tasks. Built for speed and energy efficient usage, this Quad-Core CPU that has been clocked at 2.35GHz allows you to enjoy the latest games, FHD movies, and the most demanding of mobile applications without dropping a frame. Added to its stunning processor comes a mesmerizing 6GB of RAM that supports the most excessive of multitasking sessions out there – allowing you to enjoy numerous of the top-end features this Android smartphone has to offer simultaneously without needing to worry about slowing down your device. Simply head out to the Play Store and download the latest, games, movies, applications, and more – the OnePlus 3T Gunmetal is guaranteed to handle whatever you throw at it and, thanks to its 128GB of internal memory, there always will be enough storage for you to save all your files and media alike. Featuring two IMEI numbers, this flagship Android phone allows you to be connected to two 4G network providers simultaneously – not only increasing your overall data coverage magnificently but also allowing you to be reachable on two phone numbers while using merely one device. Added to its 4G connectivity that provides you with a lightning fast internet connection anywhere in the world, the OnePlus 3T smartphone also supports Dual-Band Wi-Fi that allows you to download files and stream online media in the blink of an eye whenever you’re at home or at the office. Thanks to its massive 3400mAh battery that brings along countless hours of continuous usage time, this Chinese smartphone lets you browse the web and lets you enjoy all the latest Android 6.0 features throughout the most demanding of days without needing to worry about battery life. With this Android phone in your pocket, you’ll never have to be bored again. For all the mobile photographers out there, the OnePlus 3T Gunmetal features not one, but two mindblowing 16MP camera’s that are not only able to shoot stunning pictures – but also allow you to capture footage in breathtaking 4K resolution. From now on not a single special moment in life passes by uncaptured as, with this Android phone at your disposal you’ll be carrying around a professional-grade camera within your pocket at any time. The OnePlus 3T Gunmetal Smartphone comes with a 12 months warranty, brought to you by the leader in electronic devices as well as wholesale electronic gadgets..
Arabic: - الروبوت الذكي - Chinese Simplified: - Android 智能手机 - Czech: - Smartphone se systémem Android - Dutch: - Android-Smartphone - French: - Smartphone Android - German: - Android Smartphone - Hebrew: - הטלפון החכם אנדרואיד - Hindi: - एंड्रॉयड स्मार्टफोन - Hungarian: - Android okostelefon - Italian: - Smartphone Android - Japanese: - Android スマート フォン - Korean: - 안 드 로이드 스마트폰 - Malay: - PINTAR telefon Android - Norwegian Bokmål: - Android Smartphone - Romanian: - Un Smartphone Android - Russian: - Android смартфон - Spanish: - Smartphone Android - Thai: - สมาร์ทโฟน android - Turkish: - Android Smartphone - Vietnamese: - Điện thoại thông minh Android.